Guest Post Alert: Hi, everyone — I’m Kevin! Careful readers of this blog already know me as Shelby’s husband, or “that guy in the background who’s holding up Theo in some of the pictures”. 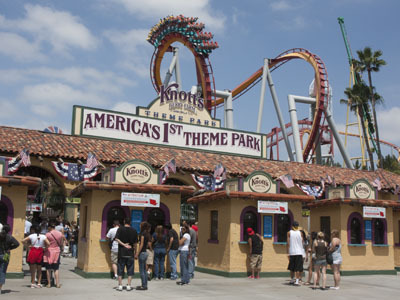 Since I’m not Shelby, I’ll be writing about something that’s not Disney: Knott’s Berry Farm. It was cheap. Not only were normally-priced Knott’s passes cheaper than Disneyland, it seemed that every other can of soda came with a $5 off coupon, or that there was always a grocery store running a discount-ticket promotion. This made it much easier to wheedle a birthday or Christmas trip to Knott’s — and bring a friend along! Later, when I was working on summer camp staff and getting paid a $250 ‘honorarium’ for the entire summer, there was no question which park we were going to for our end-of-summer blowout. It was my Mom’s park. 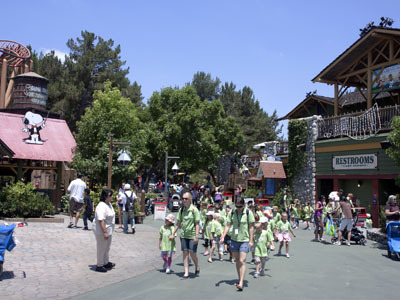 Growing up before the park was fenced (in 1968, to keep the hippies out — yes, really) and charged an admission fee, my Mom had fond memories of riding her bike to Knott’s and paying a quarter to ride the cool indoor rides on hot summer days. There were lots of things for kids to do. When I was little, there was an admission-free ‘lagoon’ across the street from Knott’s — you could pay a pittance to ride a merry-go-round, a miniature steam train, or take a paddlewheel boat around the lake. In the center of the lake was an adventure playground, with all kinds of imaginatively-carved wooden animals and play structures. 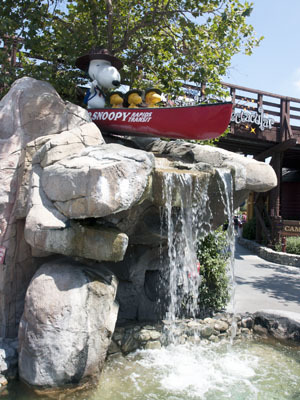 In 1983, Knott’s built Camp Snoopy, a kid-oriented, Snoopy-themed section of the park that was Valhalla for a Snoopy-loving kid like me. (And — ahem — they simultaneously bulldozed the lagoon to make up for the parking lot that they lost when they built Camp Snoopy. You can’t have everything, I guess.) We collected a double set of McDonald’s Camp Snoopy glasses. I salivated in front of the TV commercials until I got my chance to go for the first time. Years later, we go to Knott’s for the same reasons. It’s still cheap — next year, when Theo is 3 and no longer gets a free ride, we can buy a family set of Knott’s passes for the cost of one Disneyland annual passport. 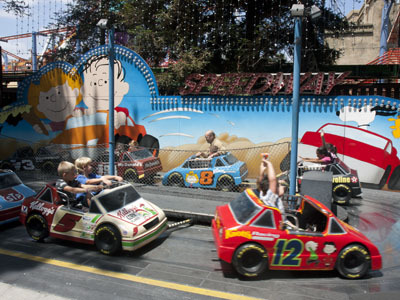 Knott’s is now ‘my’ park, with years of warm fuzzy memories. And while Theo frequently wakes up asking to “see Snoopy” (that is, go to Knott’s and see Snoopy), he’s never asked to go see Mickey Mouse. But yet, Knott’s leaves me feeling conflicted. 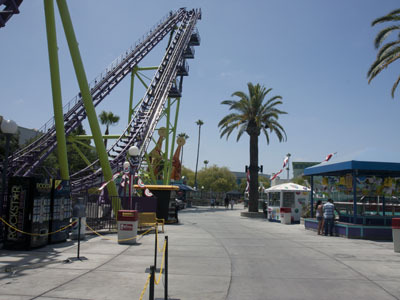 For while on trips to Disneyland, Shelby often gets to listen to me complain about Disneyland tearing out the Skyway and the Motor Boat Cruise, Knott’s is screwing with my memories on a far grander scale. Let’s start an extended explanation with a historical interlude. 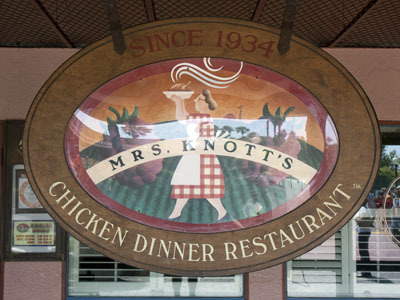 Knott’s got its start in the 1930s, when Walter and Cordelia Knott — who already had a thriving roadside business with a berry market, a plant nursery, and a tea room — decided to expand by opening a chicken dinner restaurant. It’s still there, in more or less the same set of buildings. It may not have regular three-hour lines like in the 1930s and 40s anymore, but stay away when it's time for Mothers' Day Champagne Brunch. The Chicken Dinner Restaurant was so popular that starting in the 1940s, Walter Knott (who loved himself some Americana, particularly the Old West) decided to build a ghost town as a diversion for his guests while they waited for space in the restaurant. Some of the buildings were relocated from authentic ghost towns across the west, but much of it was built (in a suitably ramshackle and aged fashion) right there on site. 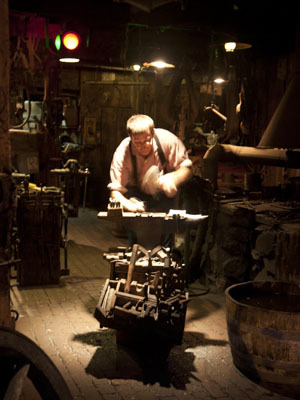 You can still get a personalized hand-hammered souvenir horseshoe from the blacksmith's shop, just like sixty years ago. 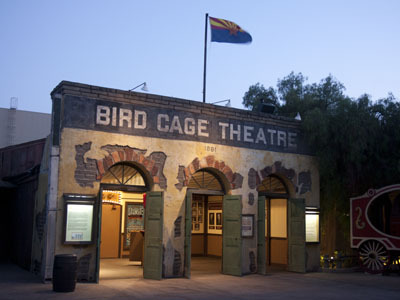 Steve Martin got his start performing in Ghost Town's Bird Cage Theatre. The theater used to host daily performances, but is now only open during Halloween and Christmastime. Not to be forgotten is the Timber Mountain Log Ride. Sure, Splash Mountain is far more slick, but Timber Mountain is the original and still my favorite. 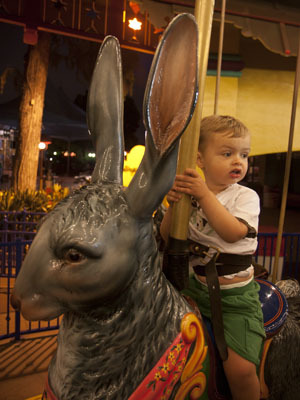 But if you’re going to Knott’s with a member of the toddler set, what you’re really going for is Camp Snoopy. As the name might lead you to believe, the architecture is National Park Service rustic; the attractions are Snoopy-themed and focused towards the smaller set. Whether you consider it a blessing or a curse, this clock is as close as you'll come to "it's a small world" while you're inside Knott's. 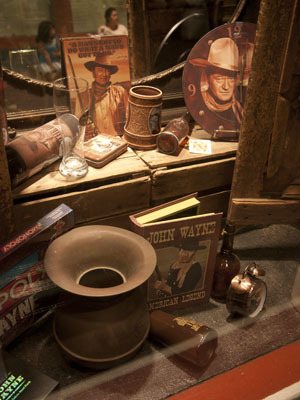 So now that I’ve shown you a bunch of cool stuff at Knott’s Berry Farm … what’s my problem? My problem, alas, is everywhere in the park outside of Ghost Town and Camp Snoopy. 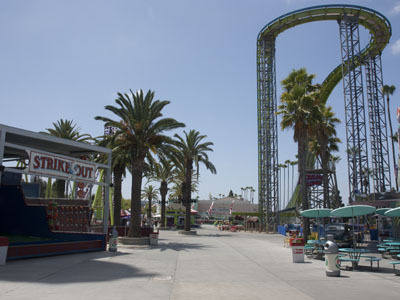 Starting in the 90s, and accelerating after the Knott family sold the park to Cedar Fair (a company that operates ten other amusement parks across the US) in 1997, the Powers That Be decided that what Knott’s really needed to add to attract a more youthful crowd was thrill rides what like those kids are riding these days. 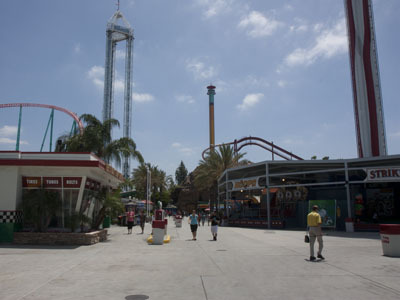 So they started shoehorning as many thrill rides and roller coasters as possible into the park, with none of the theming or thoughtful touches that make older Knott’s so attractive — think vast treeless concrete plazas punctuated by metal pylons and the occasional trash can. It’s a small park, and they’re pretty much using all of the space that they have. Who knows what the future will bring? 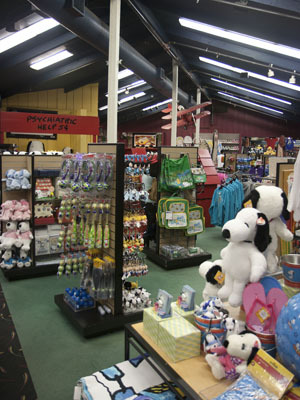 If you're in the market for something Snoopy, the Snoopy Headquarters is the place to be. And if you’re a fan of kitsch in its many forms, don’t miss Virginia’s Gift Shop. (Who was Virginia? One of Walter Knott’s daughters.) 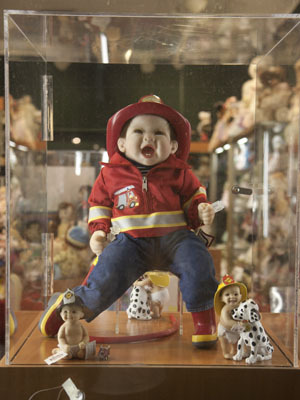 If it’s vaguely ‘collectible’ — Precious Moments, Department 56, cut glass, music boxes, weird dolls — it’s in here. If it’s ‘Americana’ — John Wayne, James Dean, Elvis, Route 66, Southwestern “Indian” art with wolves and Kokopellis and stuff — it’s in here. If I wanted to buy a black velvet painting of John Wayne and Ronald Reagan high-fiving a Bald Eagle (with a tear in its eye) as the three of them ascend to meet Jesus in Heaven, this would be the first place I’d look. What did I tell you about John Wayne? And what did I tell you about weird dolls? I have no words, other than to say that someone who'd actually buy this should probably be placed on some kind of watchlist. 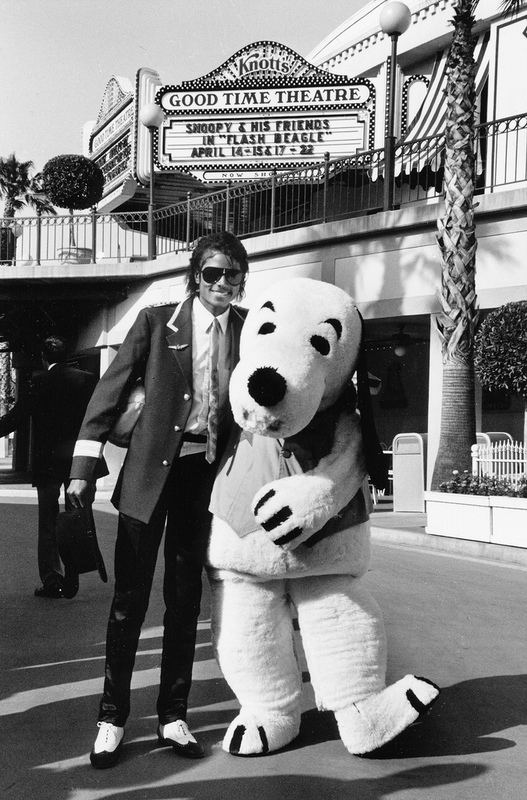 Yes, that’s who you think it is standing next to Snoopy. And in the background, the marquee is advertising a stage show based on the Peanuts TV special, “It’s Flashbeagle, Charlie Brown“, the most forgettable Peanuts special ever — except in our house, where Theo asks for it by name (“Flashbeagle? See … FLASHBEAGLE! !”) and would gladly watch it over and over again all day long, if given the opportunity. 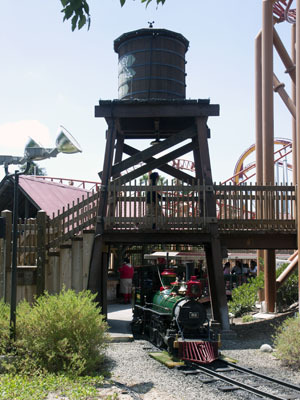 Nice look at Knott’s – lots of memories for me too even though I was more of a disney kid. Did you know it is almost impossible to find boysenberry jam outside of CA? i was in Knott’s Berry Farm with your mom! more than once actually…. my father also loved knott’s (more than he liked disneyland). a trip to california was not complete without the knott’s trip. i have so many fond memories (and really bad home movies) of my visits. they used to sell jams and jellies (“knott’s berry farm”) up to my last visit which must have been in the mid-seventies. do they still sell them? 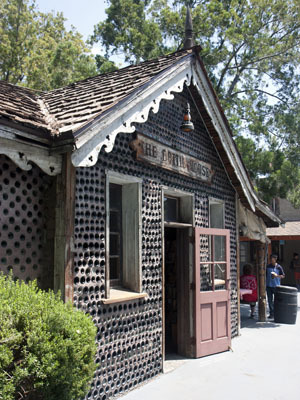 Kristy: They still sell Knott’s-branded jams and jellies, but they’re not made on (or near) the park anymore. The Knott heirs sold their food business in 1995; it eventually ended up in the hands of Smuckers, who closed down local operations a few years ago. 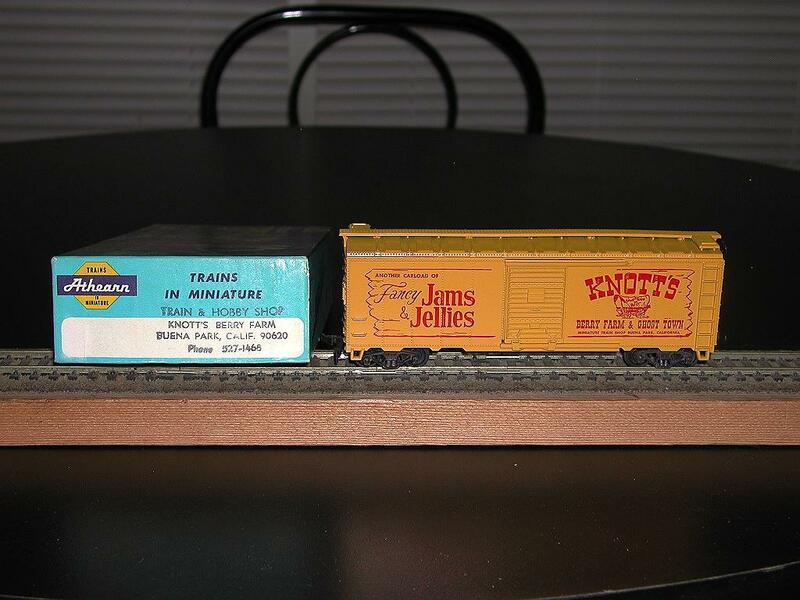 I assume that “Knott’s” jam is now made wherever Smuckers jam comes from — Ohio? Mexico? I’ve still got one of my own. The model railroad shop is, of course, long gone. Great report – Shelby should be proud! I’ve never been to Knott’s. I’m kind of sad that my parents didn’t take us there when we were kids. We went to Disneyland (I was 9 and my brother 10), and we spent a day at Hollywood Studios. My cousins went to Knott’s though when they went to Disneyland a few years later. On the MousePlanet blog people are really against going to Knott’s. They say it is awful since the sell out. I’ve seen the map online and it looks crammed with coasters like Six Flags. I still think it would be nice to visit though. 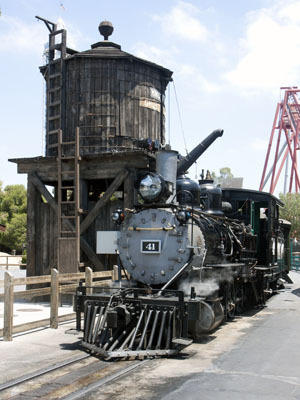 If I didn’t live in Southern California, would I make a special pilgrimage just to visit Knott’s? No. 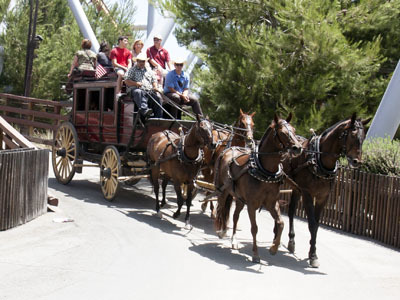 But would a day at Knott’s be a perfectly pleasant way to spend one day of a planned Southern California vacation? Yes. The park still has a lot of charm left, a lot to offer even if you’re not a coaster fan (especially if you have kids), and it’s certainly not dirty or threatening or anything like that. IMHO, give Knott’s a chance! Thanks for the guest post, Train Guy. Great photographs! The photo of the doll is giving me nightmares though. I’ve always wanted to know more about Knott’s, so thanks for writing this. It’s interesting what you say about the roller coasters. See, we’re a Cedar Point family, as my family lived in Cleveland for a time. Every summer we would spend a day there, and so I grew up loving roller coasters. Because of this, when I would visit other amusement parks, I was always a little disappointed by their lack of thrill rides. 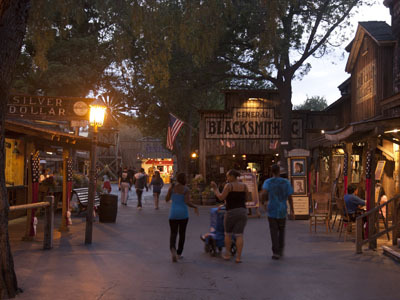 But knowing a little about Knott’s makes me appreciate its unique character, like the ghost town area. I can see why in this park, the thrill rides are encroaching on the park’s original charm. I have to ask, instead of a cuckoo for the Snoopy clock, is it Woodstock who comes out? Because that would be pretty brilliant. You know, it’s not that I’m anti-thrill-ride — it’s just that The Powers That Be chose to be so dang cheap when installing these particular thrill rides. It’d be nice if they put something back there other than vast stretches of concrete, carnival games, and soda machines so that the area didn’t scream REVENUE MAXIMIZATION ZONE quite so loudly — just planting some trees (real trees, not palm trees) would solve 90% of the problem. 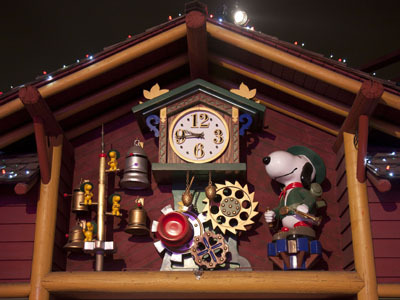 Regrettably, I don’t know what the Snoopy clock does at the top of the hour. Next time we’re at Knott’s and the right time comes around, we’ll have to walk over to watch. I would agree that Knott’s has gone downhill since the change in ownership. But as you pointed out Kevin, there are still some nice things about Knott’s and of course the nostalgia about the place (side note: does anyone remember an “alligator farm” being near where the Claim Jumper is across from Knott’s? for some reason I can recall as a kid thinking that’s what was there). Some of my favorite things about Knott’s: 1) The price!!! How can you beat $59.99 for an entire year with no blackouts? 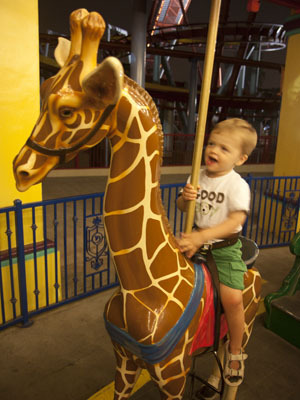 2) Little kids can ride many Camp Snoopy rides all by themselves as you watch their excitement from the sidelines (e.g. the plane ride)! 3) Parking is usually FREE and it is much much easier to get into the park from the lot (than at Disneyland). 4) The ice skating shows at The Good Time Theatre are awesome. They are actually “Disneyland caliber” shows without having to pay the Disneyland price or fight Disneyland sized crowds! I worked at Knott’s for just under 3 years (86-89) as a funnel cake girl 🙂 It was great to read your write-up. 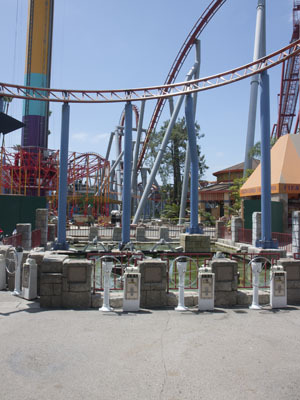 I miss the /old Knott’s/ very, very much!! I’m a Disney lover through and through, but Knott’s was always homey and cozy and a nice affordable option. Good food, good shopping, good themed rides. 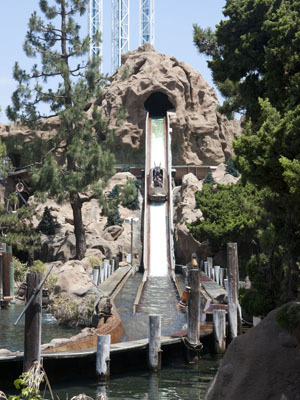 My favorite (long gone) ride was Knott’s Bear-y Tales. Loved it! I even liked it’s replacement, Kingdom of the Dinosaurs, but it wasn’t near as appealing. I also remember the alligator farm across the street! My mom also tells me of taking me on the (free) pony rides at Knott’s when I was little. Kevin, I’d be interested to hear about your thoughts on the plan in the 90s to turn Knott’s into “Disney’s America.” Did you think it was a good idea at the time? What about now? The sktch is attractive, your authored subject matter stylish. nonetheless, you command get bought an shhakiness over thuat yoou wish be dellivering the following. unwell unquestionably come further formerly again as exactly the same nearly a lot ofte inside case you shield this hike. You need high PageRank backlinks to rank in top 10.